In some ways this project resembles a bit Wikiportrait, a project to help people upload their own portrait photo for usage in Wikipedia articles. Video On Wikipedia tells you what steps you need to take in order to create and upload a video for usage on Wikipedia. It also attempts to explain why uploading video for Wikipedia is different from uploading to most other places, a good bit of evangelism for Free and Open formats for information. 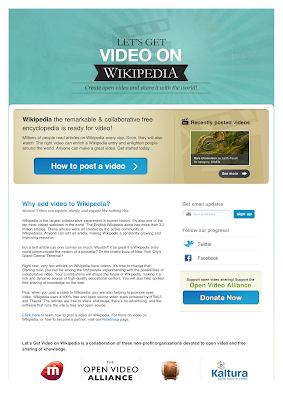 It helps people use the latest upload and display tools that have been developed by Michael Dale as part of the effort to improve video for Wikipedia. Not only that, but it also has a portal, that presents the latest uploads, editor's pick and most watched videos. The player of the portal uses the new HTML5 player that I recently blogged about, and you can comment on videos. This is a great new development and hopefully it will continue to be developed and improved upon. 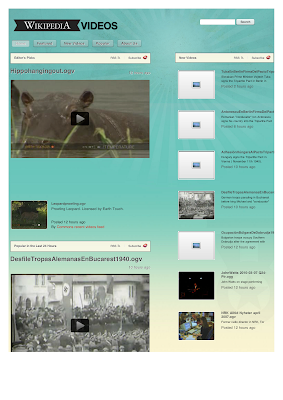 The image on the left shows the welcome page of Video On Wikipedia and the image to the right the portal for recent uploads etc.